Android M has been raining in the news without any names, so Google decides to give it a name. After all of your guess - M&M, Milkshake, Marshmallows etc. One is now correct, so M in Android M Stands For Marshmallows. It's been a while since the Android M was officially announced in Google I/O 2015. Now you guys know, the name of the Android M. The information was posted in Twitter. As you all know there are lots of cool add ons or new features are coming to Android M, one of it being the App Permission which most of the people are excited for. If you want to know more features of the Android M - click here. The two rumored Nexus Devices will be running Android M. There are some new Images leaked of the LG Nexus 5 2015. We will know what the pgone will look like when it will be officially announced. We would be updating you with that so don't forget to subscribe to the website to get the updates. 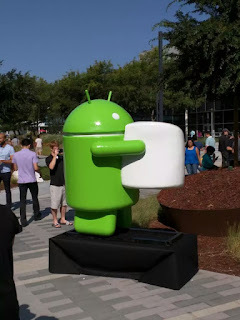 Now we know what is the name of the Android M. What do you think about the namr comment below. Till that Keep visiting, Stay updated.